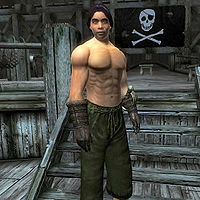 Zedrick Green is an Imperial pirate who joins your crew after you have purchased two upgrades for Dunbarrow Cove. Once all Dunbarrow Cove upgrades have been purchased, he can be sent out with Scurvy John Hoff and Yinz'r to pillage and plunder. He wears green felt linens, leather gauntlets and a pair of stitched leather shoes. He is armed with a steel cutlass and also carries a torch.